I no longer update Easy Drag. I know a lot of people use it and depend on it. So, I’ll leave it here for now. I last tested on El Capitan and it seemed to work OK. This page is no longer updated and is left here for archival purposes. Easy Drag is a utility that makes dragging objects around the screen easy, effortless and precise. This application especially shines when used with trackpad. 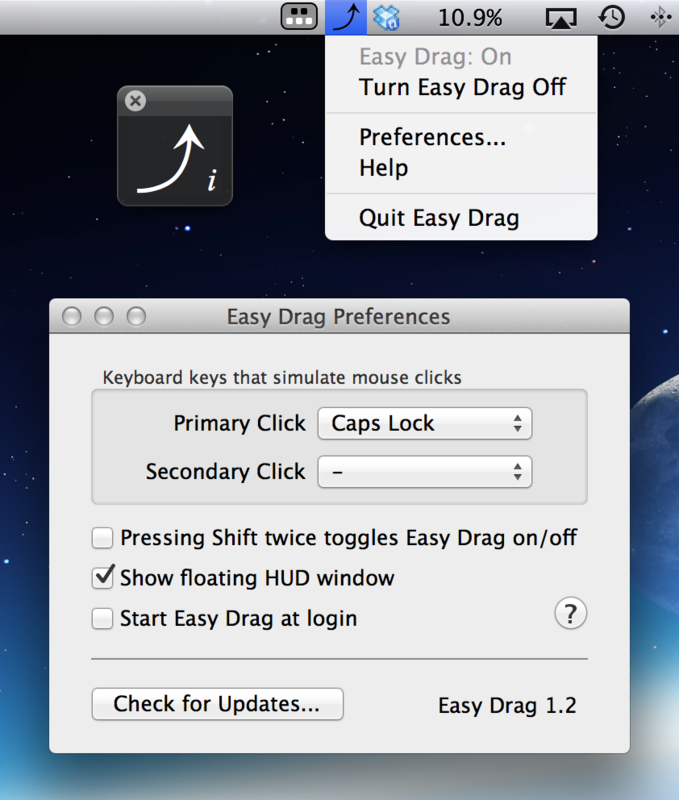 Easy Drag turns your keyboard's fn key into a left mouse button. Point your mouse pointer at any object on the screen and press/release the fn key to perform a click. Hold it down while moving the mouse pointer the object underneath the pointer will be dragged along. It's that simple. Perform left & right clicks, double clicks, triple clicks etc. When fn is not an assigned key it can be used to make the assigned keys work normally. For instance, if esc key is assigned to simulate right mouse button then use "fn + esc" key combination to send esc key press to your apps. This utility is very useful in pro applications such as Logic Pro, Photoshop and Final Cut Pro where the drag functionality is frequently required. If F1, F2, F11 or F12 are set to simulate left or right mouse clicks make sure that the Use all F1, F2 etc. keys as standard function keys is enabled in your Mac's System Preferences > Keyboard. If some key assignments do not work, enable Enable access for assistive devices in System Preferences > Universal Access. In Mavericks, you need to add Easy Drag to Allow the apps below to control your computer list in System Preferences > Security & Privacy > Privacy > Accessibility. Due to security reasons some keys stop simulating mouse buttons when typing passwords. To resume their behaviour simply click outside the password field using an actual mouse or a trackpad.